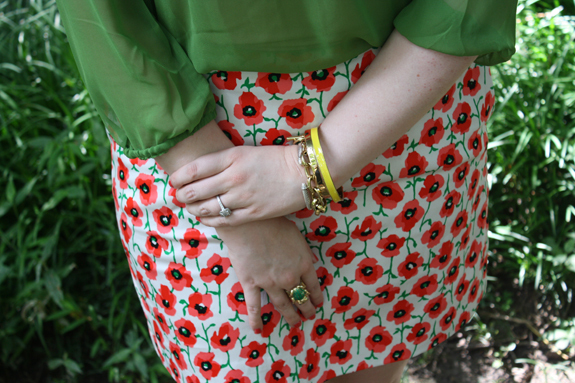 I've been looking for an excuse to wear this J.Crew poppy skirt and when The Sweet Tea Boutique sent me this green braided top, I knew together they would make the perfect pair. This top is soft, sheer, and flowy, and it can easily shift from a casual summer day to the office. I'm looking forward to wearing it to school with a pair of skinny white jeans! A stack of punchy bangles and a statement Lilly Pulitzer ring pulls everything together and adds just a little more color. Sweet, summery, and perfect in poppy! Linking-up today with Style Sessions & Random Wednesdays! That skirt is sooo pretty! I love it paired with the green top - they go together so well! So cute! Great mix of colors + patterns! You're adorable! Love your gorgeous hair.